We've had a pretty good summer when has come to waves. This morning was another wave filled morning. The south showed up over night and greeted us with brownish water and fast lines. Today's phase that payz was "wave selection". Outside bombers had some corners on them, my first wave was a couple feet over head and fast enough to make me up. Inside was tons of fun, as usual. I just took more "on the head" than usual. More in Stand Up Paddle in store bright and early. See you in the water; KPapa. Two by two we paddled to the waves. There was a great response to us SURFING in the line up with the rest of the wave sliders. Everyone was stoked, we were spotting the sets for the line up. This is what the spirit of the Sport of the Kings is all about, Aloha. Everyone was having fun, no attitudes, just good fun. And this is not a heavy Stand Up Paddle Surf spot. Others see Stand Up Paddle Surfers having the ability to catch a lot of waves. I agree, however, I know most of the waves I surf are passed up by the packed line-up, and I see a lot of my fellow Stand Up Paddle Surfers do the same. As a matter of fact, I'm seen most of the time sitting on the inside of the short boarders and having a blast. I do not deny that there are KOOKS in the Stand Up Paddle Surf community, just as there are KOOKs on long boards, short boards, boogie boards, in cars on the freeway, etc, etc, etc. That's just there attitude in life. There are a bunch of bitter souls in this world and when they see everybody but themselves having fun they boo-hoo and poop themselves. It's the Sport of the Kings, we can only expect others to hold themselves to a higher standard. So Aloha to all you Kings that share the wave wealth. Stand Up Paddle Surfers, long boarders, short boards, and all the others who have a love of the slide. And to the kooks who don't get it, we'll pray for you. Paddle with Aloha. Peace out. If you see a decline in the lineup this week it could be of the mental terrorism of sharks on the Discovery channel this week. "Alert: If it wasn't bad enough with the recent spate of shark incidents/sightings, mother nature has now decided to flank us from the rear - two young mountains lions have identified by authorities as roaming the hills together on Camp Pendleton. Keep you eyes open!" Here's a fun shot from yesterday's Gerry Lopez and Ron House Stand Up Paddle Surf demo. Hoku helo on the Ron House Hoku Honu custom. This was taken by Kevin- mahalos for the shots. More of his shots will be posted on www.kingzofthecoast.com shortly. This morning at Kaulapapas (K-Papas) Ron House and Gerry Lopez in hosted by RPS had a board demo session. There was about 25 SUP Surfers in the water. Different levels of expertise, from Gerry Lopez level to the first time in the surf. Jimmy from Quick Blade was there. Everybody was out having good fun! Met a lot of new friends out in the water today... Alohaz to all ya'll. The surf was better than the picture tells. Hope to see you in the water again. Sign up for our Stand Up Paddle Surf newsletter to be the first to see the new boards coming out soon. One resembles the Hoku Honu. Momma Mia Bond Stand Up Paddle Surfs!!! Surf was clean this morning. Offshore winds and chest to head high waves, a little inconsistent with the tide but it was sooo much fun! This is from the SC Ocean Festival- Kyle Mo rippin on his Ron House 8'11'. Photo by Pat. There is a swell running in SoCal. Gerry Lopez is in town this weekend for his movie premier tonight. It's been good fun surfing with you again Gerry. Tomorrow is the SC ocean festival, go check it out! 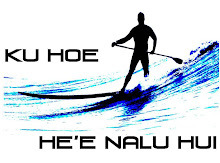 Just under a month the 2nd Annual Ta-hoe Nalu Stand Up Paddle event is going down. Looks as if its going to be a great event. B-e-a-utiful paddle, totally worth it alone. Hope to see everyone up there. For more info check out www.kingzofthecoast.com for this event and more to come. Before I get in to Stand Up Paddle Surfing's Battle of the Paddle coming to Dohney Beach I have to say, fun surf this morning. More than enough to go around. Waist to occasional chest/ shoulder high lines. Good Fun SUPS fun! Wow... big consistent surf today....NOT! But hopefully Hurricane Elida will give us some SUPS fun for the weekend. With the San Clemente Ocean Festival's Stand Up Paddle Surfing Contest this Sunday a good south could make it FUN. Oh and like the title of this posted hinted...some changes coming soon to the world of www.Kingzofthecoast.com . You'll want to stay tuned fo' sure. Back to work!! The winds were on it early today, so it was a lazy day. Cruised down to Dana Point Harbor with my wife. We like to hang out by the launch ramp and watch people wreck their stuff. It usually goes down like this; husband goes and gets the truck & trailer and leaves the wife and kids hanging out by the boat. He backs up the trailer up, she does the best she can and it gets crazy from there. Yelling and screaming.... good times. Anyways, while hanging out we saw a couple guys that had a 6-8ft shark in their bow. Suddenly I felt the urge to go paddle.... weird. So after one stop for some ice cream I grab my Stand Up Paddle Surfboard and head down to the water. It's later in the day on a Sunday and as I drive down the wind is still blowing, the tide is high and the burnt beach-goers are calling it a day. Head winds blowing, I paddle north and follow the sun's reflection in the water. 40 minutes later I make the turn-around and get ready for the ride back. Same winds now blowing on my back and 2-3 ft ocean swell I make the run south in half the time. Get back in time to watch another day end with sand in my toes. Playing around and included a map of the paddle. 40 minutes one way/ 20 minutes back. Good fun. Stand Up Paddle Surf Blessed. This is one of those, "You wouldn't believe me if I told you" moments. 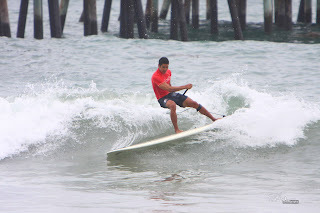 Before the marine layer overran the morning line up we SCORED great waves, great conditions, grrrrreat times. Oil glass surface, fun 3-4ft A-frames, clean clean clean lines. Nobody really out considering it was the fourth of July and no injuries to report. We only had an hour to surf so about 7:30 we paddle in. The wind starts to blow, the marine layer swallows the beach, less the a mile of visibility and the line-up becomes the traditional 4th zoo. We leave, there is already a huge line to get in, and we're grinning ear to ear knowing that what we just experienced was a gift from above. Cubito and I get there early. Surfs kinda drained out with the extreme tides but it's showing potential, some nice shoulder high peaks at times. We paddle out and catch a couple fun waves. 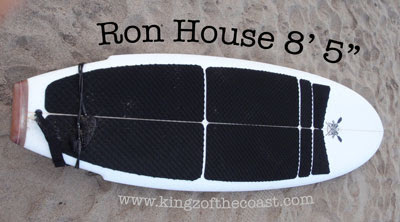 I'm still diggin' on this 9'6" Stand Up Paddle Surfboard Ron House shaped. It surfs real well and I'm having a blast. So I catch this wave and do a floater on over the whitewater, come down and go up for another. The board and me are sideways in the soup and I should of just jumped off. But I try and muscle through it cause it's small enough day, when the board gets shot up from under my feet. SMACK my head hits the board, click on the pic if you look close you can see my hairs in the fiberglass and left over skin. Apparently as I try and protect the rest of my head, a little too late, the board slices my arm. It was a bleeder so I got out. There known Great Whites that hang out where we were surfing this morning so I didn't want to become breakfast. Just a reminder, since it's the 1st of July, that this years San Clemente Ocean Festival is featuring two Stand Up Paddle events. On the 19th is the race and the on the 20th is the SUPS contest. 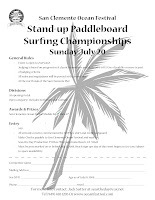 Check out Stand Up Paddle Surf Championship for more info. So the tide was "high" and the surf wasnʻt. There were some set waves that came in that made to paddle out the made you paddle back in even faster. It was still the best way to start a new week. Stand Up Paddle Surfing with some friends is good fun. We were camping this past week. Had a chance to share some stoke with some new friends from San Diego at Dana Point Harbor. April (stand up video) and her husband Eric were camping also so we had a chance to get Eric in the water. He had never surfed nor paddled at all so this would be his first time in flat water on a Stand Up Paddle Surfboard. Once in the water I had him do some basic drills, he got comfortable and I showed him a couple other techniques and boo-yah!!! Another Hoe Hee Nalu addict! How much of an addict you ask? He was so amped on the gliding across the water I hooked them up again with Ron House and Eric picked up his new Stand Up Board and paddle while still on vacation and was able to get some water time. I got some video of husband and wife playing on their new toys. I evened had the pleasure of paddling with her brother Spence and son Dane one afternoon. Stay tuned for the video...who knows whatʻs on it, me wifey was videoing!? See you in the water - in the morning - aloha! It was early afternoon and I get a phone call from a buddy wanting to go paddle. His friend is coming down from L.A. and has tried SUPS once before. With the wind and the swell we decided to have fun and head to the flat water. We cruise from baby beach and head over to disappearing beach and mess around. Tony is paddling around and getting the hang of his turning. Cubby and I are working on balance drills and Cub is nailing it. 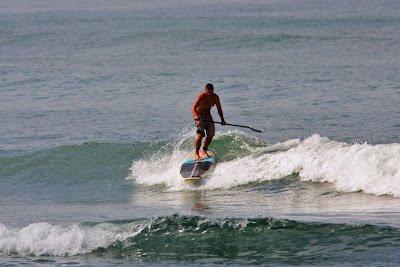 We make a lap around Dana Point Harbor and Tony is up for some more SUPS fun at disappearing beach. Tony started running out of gas so we paddled back over to Baby Beach and called a day... a fun day! On the way down to the Promise Land. The fog was in and out but the waves were consistent. Paddled out and caught a couple waves out front. A few waves later we found ourselves at the Promise Land with big racey lefts and rippable rights. Good fun... waves for everybody. Down at Dana Point Harbor this morning, April was paddling her new Stand Up Paddle Surfboard. We did a lap and went over some basic paddling and handling techniques. Sheʻs stoked with her new Ron House Stand Up Board. Hooked up with Chris and the Magic for a little talk story. He was sporting a inflatable SUPS board- interesting. No travel issues, deflate and roll it up. Met a couple or SUPSers, Steve, Dave... wasup! This event will be held during the San Clemente Ocean Festival on Sunday July 20th. This is the first Stand Up Paddle Surfing Championship ever held during the Ocean Festival. On July 19th the Stand Up Paddle Surf Race will be help, like last year. The last swell is still trickling in. Go a get wet if you can. The sun is coming out and itʻs looking like another beautiful day to Stand Up Paddle Surf in Southern California. Great little nalus that needed to be caught... and they were. Check out www.kingzofthecoast.com for some more Stand Up Paddle Aloha. This month's copy of Forbes Life [june 08] is blasting the cover with Laird charging Teahupoo. I wouldn't get to excited...seeing the cover I thought there would be a better spread... page 58 & 59, right after the million dollar Bugatti... you decide. How good is it? So Laird charging Teahupoo, on a Ron House custom Stand Up Paddle Surfboard, on the cover of Forbes Life. The real question is, why would a beach bum have a subscription to Forbes? Got a break and made a break to the break.... give me a break!? What a great session. Don't want to talk it up but it was unreal. 2-4 ft clean lefts and rights peeeeeling. Little crowd, plenty of waves, warm air, clear skies. Fun! The only Stand Up Paddle Surfer out, called in some sets for the guys that couldn't see'em coming in. Everyone was stoked. Even pulled off some helicopters...good fun. Had to call it when the arms stopped working. Sunday evening....hot day and no surf, so I thought. Grabbed the Stand Up Paddle Board and cruised down to one of my favorite spots. As I'm paddling up some weird-o started yelling and screaming and whisting on the beach like a preteen girl at a Hanna Montana concert (only you know if you actually clicked on that link). Turns out to be a good buddy of mine from the jar-head days and his son. We talk story for little and he decides to paddle out again cause he knows that he surfs better when he's tried, eh' Kawika!? So we end up at the spot and score some fun waist to chest surf as the sun goes done. Evan, his son, scores a great little wave and is really stoked! Right on Evan....shred the NAR! As it gets dark I make the paddle back to the car in the warm air. Smiling- life is good. The spirit of Stand Up Paddle Surf is simply the Aloha Spirit. The true Hawaiian Aloha Spirit is more than a simple greeting or salutation. It's a mutual, respectful regard towards another. While in the water everyone should practice the spirit of Aloha. Whatever segment of surfing you choose; from body surfing, boogie boarding, short boarding, long boarding, Stand Up Paddle Surfing, to tow-in surfing. It's all wave sliding. As a Stand Up Paddle Surfer there is a ancient majestic feeling that overcomes you when you glide across the waters and paddle into waves. It's addicting and you'll want more. The Spirit of Aloha balances that desire and impart water wisdom on a true Stand Up Paddle Surfer. Unfortunately there are a few people out there that are ruining the reputation of the royal sport of Stand Up Paddle Surfing. There are those in the water representing our sport improperly, without the Spirit of Aloha. With the benefit of board design and paddle the ability to catch waves increases with skill. These same individuals have the same impact on the longboard community. Given an advantage, they exercise it beyond reason and ruin the surf session for others in the water. NOT what the community of Stand Up Paddle Surfing promotes. The Aloha Spirit is of the King of kings as well as the sport of the kings. If you're going to be standing tall you better not ruin it for us all. This isn't about who catches more waves, as kingz and queenz we need to promote the true spirit of life in the water. Live Aloha! Surfing. Most of the attention Stand Up Paddle Surfing generates is from wave riding and sliding. It could be the guy standing on the outside of the normal line up scanning the horizon or the wahine doing a front side cutback leaning on her paddle. Either way it will make you look twice. There are a lot of advantages that Stand Up Paddle Surfing offers to a wave rider. A lot of the buzz that surrounds Stand Up Paddle Surfing is the idea that you can paddle into a wave earlier than the modern laydown surfer. While this is true, we DO NOT promote the wave hog attitude. Just the opposite, as another advantage to Stand Up Paddle Surfing is the ability to see the lines of swells coming towards the pack. As a Stand Up Paddle Surfer you can spot waves and let others know how many are coming and where to be. That's sharing Aloha. Another benefit is moving from one peak to another. As you scanning the horizon you might see a peak rolling in that nobody would be able to paddle to. As a Stand Up Paddle Surfer you can stroke over in time to catch it deep and make a nice wave that otherwise would go unridden. While on the wave you can use your paddle to stroke through what could be unmakable sections. This makes for really long rides. Check out the Crowd...? Using the paddle while on the wave is a whole other experience. While making big turns you can drag and lean on the paddle helping you make awesome turns and adding some real old school soul to them. You can charge any size surf. You can paddle to surf that is rarely ridden. You'll being paddling along your coast and find spots that break on different tides and have it all to yourself. Remember that half the fun of riding the waves is getting there. With all these added benefits to modern surfing why wouldn't you want to Stand Up Paddle Surf? And remember, because you have these advantages doesn't mean abuse with, Paddle with Aloha. Don't be a kook! So there is a little south swell trying to show. Tide is filling in right now but it was fun this morning. Dennis was out at a fun spot this morning catching some fun waves. Chest high lefts and rights. Good fun. Happy Aloha Friday. 2 hours of good fun with good friends with playful waves and clean conditions in the middle of the day with only 5 guys out...what a gift. Then a good sunset session down at Kualapapa with a bunch of Stand Up Paddle Surfers in the line up. There was one guy with his little girl hanging on the board with him- sweet ohana aloha. Oh and whatever he was cooking for dinner smelled ono. There is a different vibe in the water with a bunch of Stand Up surfers, it's all about having fun. Surf is small in SoCal with south winds blowing... thank you Catalina Eddy. So grab that Stand Up Paddle SURF board go practice in the bump and get some fun.